I like to cook lamb chops quickly, in a frying pan, on high heat. Only seven minutes later, dinner’s ready! 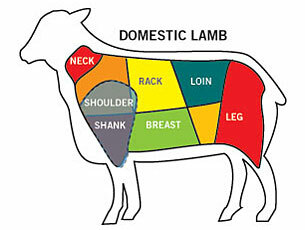 There are many different cuts of lamb available. A ¾ inch thick chop is the optimum size to buy. Thinner chops tend to get over-cooked very easily. Figure on 2-3 chops per person. Start by sprinkling some salt and pepper on both sides of each lamb chop. Preheat your non-stick pan on high heat. To tell if the pan is hot enough, add about 1 Tablespoon of water to the pan. The water should sizzle and evaporate immediately. Add the chops to the fry pan. You should hear them sizzle! If they are not sizzling, then your pan is not hot enough. Set the timer to 3 ½ minutes to 4 minutes. When the timer goes off, flip the lamb chops, using a pair of tongs. Continuing cooking on the flip side for another 3 ½ to 4 minutes. Mint sauce is traditional with lamb chops. Some people prefer mint jelly. You get to choose! 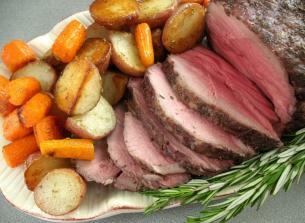 If you are feeling adventurous you might want to give cooking a Leg of Lamb a try! All of my recommendations and cooking times are based on meat taken directly from the refrigerator. I’m a fan of lamb, but sometimes find it a bit ‘fatty’ whcih is why I prefer to cook it under the grill (broiler) so the fat drains off. Also if you cook it that way, the you can baste it as it cooks – my favourite is a mix of olive oil, fresh chopped rosemary (a GREAT herb to have with lamb) and garlic. Cook the lamb for 1-2 minutes, baste the chop, cook for another minute or so, turn baste and cook for 3-4 minutes – yum. In my view lamb has to be served a little pink, but cooked tis way it is so tender and juicy. Sounds good… I’d like to have seen one cut open to get a feel for the doneness you’d get after 3 1/2 minutes. Also, do you let your meat sit out for any amount of time or straight from fridge? I did take them directly from the refrigerator where they were very cold indeed. They sat on the counter only for a few minutes while I seasoned them and preheated the pan. Jon, I’m going to give the broiler a try next time. Thanks for the tip! For your info, most recipies in cook books are based on cooking meat from room temperature rather than from the fridge. Hmmm. I guess thatâ€™s why a lot of steak houses give detailed descriptions of what rare, medium-rare, etc actually looks like! I prefer to panfry. Broiling was way too hot and the marinade I used started a small grease fire. Scary and not worth it. Tastes great off a pan. I agree with you Matthew! Pan fried lamb chops cook up in no ti;me and are delicious! When I pan fry lamb chops I like to add a small combination of red wine, olive oil, rosemary, and dill to the mix. For me, it adds for a rich full flavor that complements the strong lamb meat flavor. Jason that sounds delicious! Do you use fresh or dried rosemary and dil? I usually do my chops on the George Foreman, I baste them with a mix of soya sauce, yellow mustard & fresh garlic – absolutely delicious!! THIS IS MY FIRST TIME TO TRY LAMB CHOPS AND WANT THE BEST WAY TO COOK THEM. Hi Richard, why not give this recipe a try and let me know if you have any questions! I never has lampchops before. My friend just gave me three of them that are marinating in Teriyaki sauce. I will cook them on my George Grill, also. I hope they come out good. I will try 3min. ea side. Hopefully that will be good since we like our beef cooked med. I am going to grill the on Mon. If you have a suggestion for me please let me know, thanks. Hi DMSEE, I like cooking Lamb Chops with my George Forman Grill. They don’t get quite as crispy as when I do them in the frying pan, but the fat just drips away! I hope yours turned out well? Hi Kathy, The Lamp Chops I made on the George Forman grill came out great! However, they took a lot longer then 3 min. on ea. side, My grill doesn’t have a temp. control so it’s one way cooking. It was more like 10 min. on ea. side and worth the wait. They were still pink and delicious. Thanks so much for responding to my post. DMSEE, I’m delighted they turned out well! I’m not sure I understand when you say “10 minutes on each side”. Are you closing the grill cover down on the lambs or just cooking one side and then the other? Hi Kathy, OOPS!!! I meant 10 min. total. Yes, the lid was closed. Thanks!! Kathy, I just returned from the store -guess what I bought – LAMB! lol I am cooking it for myself for Mother’s Day – and as a gift my husband has agreed to eat it (uncultured swine – lol). I am going to follow your original recipe (pan fry) – do you marinate the chops at all? Hi Sony, I hope they turned out well! No I do not marinate the chops but I do love lots and lots of mint jelly with my lamb chops! I marinate my Lambchops in a ziplock bag with olive oil, a lil balsamic vinegar, garlic powder, and a few sprigs of Rosemary . That marinates overnight. I Pan fry them in a splash of white wine for apprx. 10 minutes and they are a perfect medium , so tender and flavorful. Recipe sounds great! Marinating in a Zip Lock bag is a huge time saver. I often set the bag on a plate (or bowl) in the refrigerator, just in case it leaks. Lamb chops are a a great meal anytime of the year and are so quick and easy to cook! This is my first time cooking lamb chops and after reading all of these great recipes I think I will use the soya sauce musterd and garlic mixture and pan fry them with a splish of white wine and evoo. Good Luck Diane! Your recipe sound great! I always keep some lamb chops in the freezer for a quick meal. I did it! I cooked them just as you said – (well, almost) – and they were fab!! After evaporating the water I just couldn’t resist adding some olive oil – well, it looked soo dry!!! I always keep some lamb chops in my freezer for a quick meal. I bought some lambchops from my local grocery store but when I opened the package, they smelled like they had just left the farm. The smell was really strong but the meat looked fresh. Tell me what I should do about it. This is only my second time at cooking lamb. My incredible butcher gave me two beautiful lamb chops along with my regular order (Happy Holidays to me!). I had no idea what to do with them… and here you are along with all you wonderful reviewers with tons of scrumptious suggestions. P.S. I AM a beginner. Two years ago when I started I saw a William Sonoma roast lamb recipe. Want to talk easy and delicious? Want to have you guests rave? Check it out for oven temp and time but you make tiny slits all over the lamb and insert sliver thin garlic slices and press juniper berries into the meat. Salt/pep…and rub the roast with olive oil. I’ve made this twice – and people are still talking about it. What’s even funnier is that friends have said people are afraid to make roast lamb. Guess it pays to be a neophyte…I just forged ahead with great results. Beverly, my motto is “when in doubt, throw it out!”. Joan, I love the idea of the garlic and juniper berries. I will have to give it a try! Thanks for the step-by-step guide. I’m learning to cook and really appreciate this. Your site is a good example of how to blog well. I’ve just bookmarked your site and am looking forward to reading all your great tips on blogging! I’m cooking lamb rib chops for the first time and wanted to pan fry them. Came to the site and got the cooking times, thanks. I have done lamb chops in the past but have grilled them. My recipe: Marinate them in Syrah or Shiraz wine(both are the same just one is from Australia and the other from the U.S. with garlic, rosemary, and salt and a little pepper, and refrigerate. The chops will turn a dark purple color and that’s when you know it’s ready. then grill at about 375-400 degrees for about 5-6 min on each side depending on thickness. They are awesome!! Thanks for some of the other tips guys. Ohhh, your recipe sounds delicious! Can’t wait to give it a ty. Not being a big wine connoisseur, I had no idea about the Syrah vs. Shiraz…very interesting. I have a question. My mom was making lamb chops in the oven but we had to run out- they were in for a just a short time-probably half cooked & she left them on the counter for about 2 hrs. We came back & ate them. Was that a good move??? Should they have been put in the frig while we were gone? I think that within the next 4 hours you will be able to tell us if it was a good idea to have eaten the lamb chops! This was my first time making lamb chops and I followed the recipe, and they were great, my son loved them and he’s a picky eater, I would like to find more was to cook them. Congratulations Jetta! Nothing like being able to satisfy a picky eater! Try Googling cooking lamb chops and you will discover about a million more choices! I likethe fat on lamb chops to be crispy so would prefer to cook them in the oven. How long and at what temperature should they cook. If you google cooking lamb chops in the oven you will discover tons of recipes to choose from. Some recipes have you roast them at a very high temperature for a very small amount of time while others have you sear them in the pan first and then continue cooking them in the oven. My Dad, was a butcher in Manhattan for 35 years, He never timed anything cooked on the top of the stove. He told me good chops are just right when a person without teeth could eat them without teeth. The chops were always pink on he inside. Hey, my fiance and I are going to be trying Lamb chops for the first time. We are going to be trying your recipe, and I will let you know how it goes. but have zero experience working with a BBQ or a smoker.